What is a snowman doing on the front cover of a book bearing what I think looks like an African boy in a village setting? 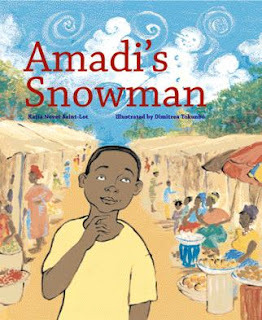 Little did I know that it was curiosity of this nature that was the basis for the transformation in young Amadi's life, the central character in the book Amadi's Snowman. Amadi is a native of the Igbo tribe of Nigeria in Africa. The story is set in a hamlet in Nigeria, boasting marketplaces and friendly faces amidst which Amadi is raised by his hardworking mother. What we come to understand after the introductory pages is Amadi's impregnable resistance to learn to read. He strongly believes that the ability to read is unneeded for an Igbo boy whose stereotyped ambition is to grow up to be a business man. Wandering at the marketplace, Amadi chances upon his friend Chima furtively buried in a book. It is now that Amadi's eyes fall upon an image of a boy bundled up in clothes next to a strange animal with a nose that looked like a carrot. Everywhere around, the ground and trees sparkled, blinding white. To some of us the image of a boy and a snowman could seem effortlessly digestible but to an Igbo man in Africa whose land is drenched in sun all through the year, this can sure seem hard to gulp. His ignorance is dispelled by Chima, who now seems to be the all-knowing idol to Amadi. But Chima soon takes off abandoning the book and poor Amadi who stands there with a whole lot of questions queued up in his head. This incident sows the seeds for Amadi's genuine enthusiasm to read, to learn, and to discover. Amadi's quest does not end here. He begins to realize the existence of a lot more beyond his small world, like the snow and snowman. But they are all going to be out of reach if he did not know to read. The climax is when Amadi finds the same book in his house, gifted to him by Mrs. Chikodili, his tutor whom he is seen avoiding all through. You can tell Mrs.Chikodili I'll learn how to read are Amadi's final words in the book. The depiction of the life of a rural African boy can itself be intriguing to urban children. The rustic scenes painted in warm earth tones come as a bonus, thanks to Dimitrea Tokunbo. The book is also overly apt for Saffron Tree for more than one reason - not only is it truly multicultural as in being a story about a tribal boy in Africa and created by a well-traveled author who now lives in India, but it is also one that spoons children the motivation to learn to read. The initial resistance to read that Amadi exudes is probably a feeling that all young children might be able to relate to and the fact that the story can eventually inspire them to read is the most wonderful and powerful thing about this book! Nothing says this like when my 4 year old worriedly and hurriedly ensured "Ma, I know to read, right? I will know to read much better on my own, right?" as I slowly closed the book.Thumbs up to Katia Novet for this neat package! Literacy is a heavy subject and to translate it to young children is a daunting task. But looks like Katia Novet has effortlessly and wonderfully accomplished this endeavour. Dear Dimitrea and Katia, thank you so much for stopping by. Hope the success of the book opens new doors in your life, just as we hope it will in the lives of many children! Thanks once again and good luck to you both! Meera, A very nice review.. wish I could get hold of that book now!